Comment: VHS VIDEO in Very Good Condition.Posted in brand new jiffy bag. Two more early adventures from the Terry Nation sci-fi series. In 'The Web', telepathic members of Cally's race force her to lead the Liberator into a trap. 'Seek, Locate, Destroy' sees Cally taken prisoner by Blake's evil nemesis, Travis. 5.0 out of 5 starsWELL RECOMMENDED! For the summer sale price of 25 quid this box set is excellent, but it's 4 DVDs per series and most are stored two per spike which can cause scuffs and scratches when taking them out of the box or putting them back. it's up to you if you take the discs out of this pack and use a circular tub normally used for blank DVDs to keep them in the best condition. Play them through a Blu Ray player and the picture will be upscaled anyway meaning the outdoor scenes filmed on 16mm might look sharper (even if there will be more grain and you will have to make different adjustments according to your particular flat TV). However some studio sections to series 1 episodes show signs of tear on the broadcast tapes that didn't happen with the VHS versions and other transmission quirks like shaky titling, have also transferred across to these Dutch DVDs even if they are the sharpest you will see before any purely digital version from the BBC store in future, or a Blu-Ray remaster. It's easy enough to turn off the subtitling even if by the third disc I just left them on and they didn't distract from watching the show. If all you want are the episodes and you're upgrading from the VHS tapes this is a bargain and the extras a bonus, however anyone that had bought the individual DVD series box sets with tidied up effects will have to check the extras disc in this one and see if they think it's worth buying all over again. The only missing gems from the extras list were the two Blu Peter "Make Your Own Teleport Bracelet" clips which are on the s1 and s4 DVD sets, plus Kevin Jon Davies' full documentary divided by series 1-3, selections of which are in the extras for this box but that content is all on Youtube anyway. As for the actual episodes watching the series again for the first time in seven years now I feel that the show was a series of two halves, series 1 and 2 hooked in the audience with the continuing plot and it was Terry Nation's baby with help from Chris Boucher and other established BBC TV writers - but I only saw these earlier series thanks to repeats. After cast changes and Nation's move to America, series 3 and 4 concentrated much more on adventures with diversions from the overall story arc or concentrations on individual character stories and James Bond-level cheeky humour. 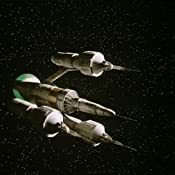 Following Star Wars the continuing big-screen influence was felt by allowing the "good guys" to use realistic-looking guns following the more alien Liberator weapons. It had the same influences from Star Trek in some places where compelling guest characters wouldn't be seen again probably due to budget, but it was fun spotting 1970s and 80s names from British acting before they broke out into bigger roles (eg Brian Blessed, the late Ronald Lacey aka the lead Nazi from Raiders of the Lost Ark, and sixth Doctor Who Colin Baker, and many others). 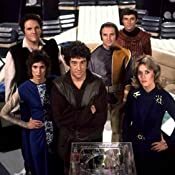 Having watched all of them now, series 4 has enjoyed retouching of its effects in this Dutch set rather than remastering since they made early use of computers back in the day, meaning the overbright (CSO?) halo effect superimposing the models on space backgrounds is massively reduced or completely gone. Other 16mm stock sequences still enjoyed that Thunderbirds charm. That made my favourite s4 episode Gold, easier to stay involved with and enjoy seeing again. Also Roy Boyd (the actor playing Zukan in the penultimate episode) follows Colin Baker from series 3 in overacting over (even) Paul Darrow in an ironic way and stealing the show, which I didn't notice as a kid but now provides extra unintentional comedy. The downside is that the early outdoor scenes in the very last episode have gone from slightly blurry on VHS to almost too sharply rescanned on DVD through a Blu Ray player. Through a standard DVD player and a RGB SCART connection though, and this issue is reduced although you'd have to switch to a "cinema" preset and wash out the greenery of any outdoor scenes and gold detailing on sets/costumes (and naturally on a CRT television this never happened whatever player you were using).. However the horizontal banding in the scenes set in darkened interiors on the VHS version played through flat screens, has been properly cleaned up on this DVD set. One vertically black scanline from Episode 52 on the VHS tapes, despite being removed, is still detectable so the limitations of the remaster are showing up and it's unlikely there will be a frame-by-frame cleanup before the 40th anniversary in 2018 if the effects were already re-done on the individual sets. Even so, final episode aside it's probably the best the series will look before the next transfer or any BBC Store digital version. The sound transfer on some series 3 episodes was also not the best it could've been (probably my individual set), so for that other reason I'm keeping my VHS tapes with their much louder analog sound and getting a new box to keep these DVDs in so there are no more scratches. 5.0 out of 5 starsGreat to See it Again. 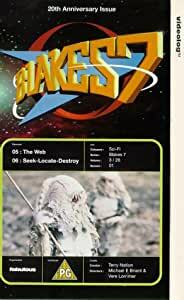 We last looked at buying "Blakes Seven" a couple of years back, but it was quite expensive at the time. Recently I found the entire series has been put up on YouTube and we watched the first couple, but felt guilty about it and on coming back to check again we were thrilled to find it at a much more reasonable price now. I haven't see it since I was a kid and was worried that it might be one of those series that is best remembered through the rose coloured glasses of yesteryear rather than watched today. But in fact I'd say that the drama itself has stood up really well to the test of time and while some of the visuals might feel a little cheesy now, it's in a nice endearing way and frankly only adds to the fun. All in all we're really enjoying this boxed set and I'd recommend it to anyone who can still hear that theme tune in their heads and fancies seeing it again. The contents of the DVDs are excellent. For me, the major problem is that the packing is woefully inadequate. Too many DVDs are squeezed into a single container. The DVDs do not remain in place on the spindles and therefore they are rattling loose when the box is closed: and when the box is opened at least one of the loose DVDs falls out, onto the floor. Very poor storage indeed. This number of DVDs should have two boxes with ine spindle per disk, thus keeping the disks in place. the box thou can mean dvds get damaged thou it's not music that you wud be using over & over again/in & out of the box but they fell out often just moving the box. we've removed the dvds from the box & put them elsewhere. BUT again the price is terrific. you pays your money you take your chance. This chunky box set is excellent value - all four series for under £20 (at time of purchase). The main menus give the episode titles in English, and the Dutch subtitles are easily removable; just switch Subtitles to "Off" on your player remote. The best thing about this set is that the episodes look visibly cleaner, brighter and sharper when compared to the original UK dvd releases - I suspect these discs just have superior encoding rather than having been restored in any way. Either way, it's a clear improvement on the old discs. A great price, better picture quality and a space-saving box - you'd be mad not to snap up a copy.